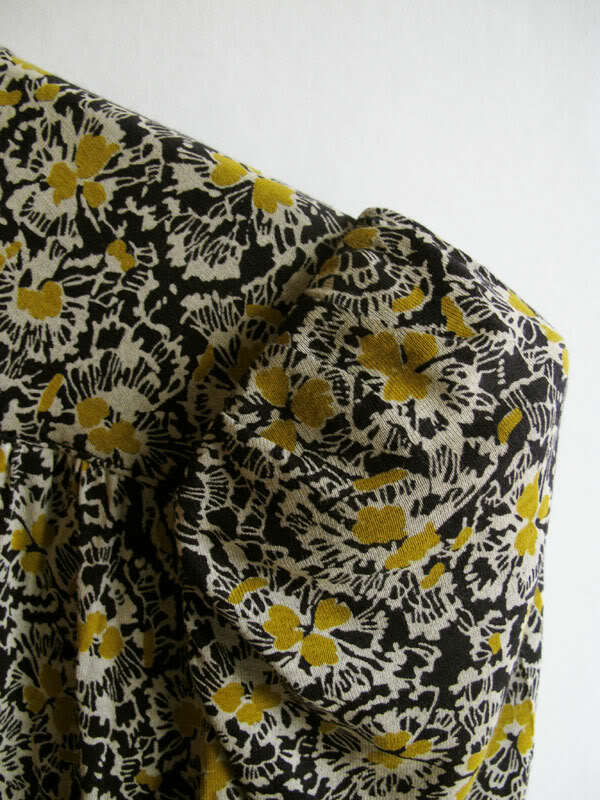 Now, you all know I’m fond of a floral dress. 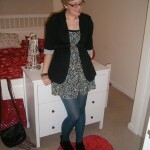 For me, the epitome of autumn style is a cute tea dress, thick tights, a chunky knit and some leather brogues. But ladies, we’re talking about alternative autumnal outfits. And floral dresses in autumn are about as alternative as My Chemical Romance. If you’ve followed me on Twitter for a while, you might recognise this jumpsuit. I first tried it on in summer 2010 (and tweeted a photo of me wearing it) and fell in love, but at £95 it was far too expensive. So I bided my time, watched the sales like a hawk and finally, just after Christmas, spotted it for £20. High five! I snapped it up and wore it a few times over summer, but I think it works wonderfully as part of my AW wardrobe. I wore it with ballet flats instead of sandals and threw this cuddly mohair cardi over the top (another item from my charity shop knitwear haul, bought for £3.50), but it works equally well with heels and a blazer for a smarter look. The jumpsuit finishes off four days of alternative autumn outfits – first it was the leather trousers, then the non knee high boots and yesterday, the sequin skirt. So, do you have a favourite? Which would you wear with pleasure, and which have no business in your wardrobe thank-you-very-much? I hope you’ve enjoyed the Alternative Autumn Essentials series, and the other posts in my AW11 style guide (like my Look Show AW11 round-up and my Wearing the AW Trends guide). 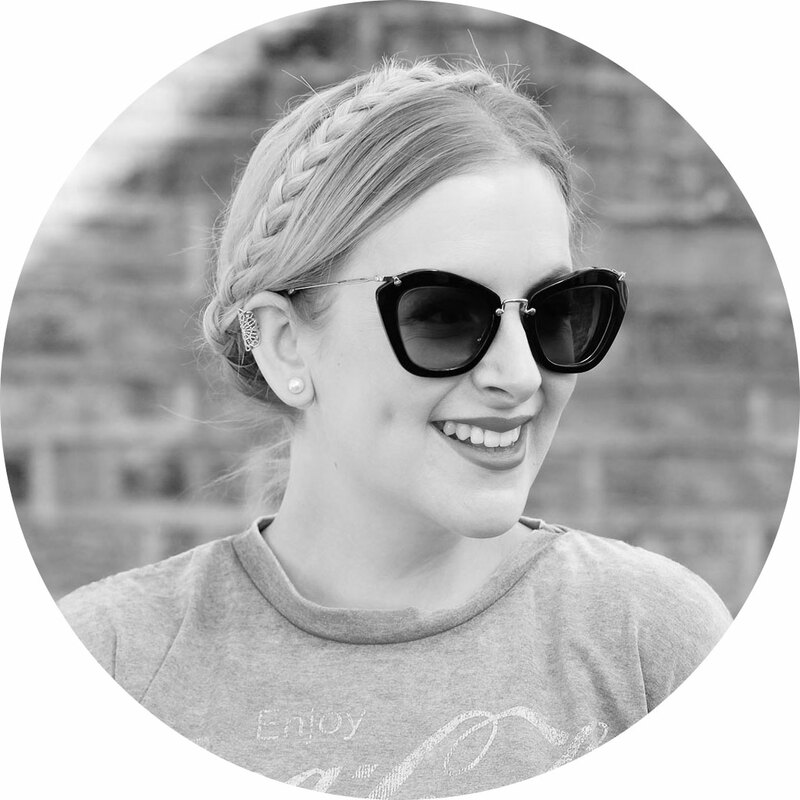 If you have, I’d love you to vote for me in the Cosmopolitan Blog Awards in the ‘established fashion blog’ category (where I’m known as Little Bird Fashion for some reason!). The competition is fierce and I’m up against some of my blogging besties, so your vote means a lot. Thank you to everyone who’s voted so far, and to everyone who reads, comments and tweets – big hugs for you all! As much as I love the idea behind jumpsuits (an outfit in one without the worry of your skirt blowing up) I rarely actually buy or wear them because it seems like getting to the toilet would be entirely too much hassle! I’m a bit scared of jumpsuits, in autumn or any other season, mainly because at 5’11 I’m worried they would give me a constant wedgie. You look fantastic, though! Love it with the necklace…lovely! *swoon* your jumpsuit is killer. That print is perfect for fall and I love the cardi you paired with it. Great look for fall! I love jumpsuits on other people and yours looks fab. What a steal at £20 too. I’m all about playsuits with tights but then they’re just an inconvenient (for loo trips) dress really aren’t they? Never tried a jumpsuit (I’m thinking my Primark onesie doesn’t count? )but may be tempted to be braver now I’ve seen this! PS as soon as I saw the first photo I was saying “Is that the French Connection one you were loving last year?” So glad you finally bought it! Shows how long I’ve been reading your blog, too! The French Connecton sale is basically the best thing ever. I genuinely wonder if they sell anything outside of sale time at all? 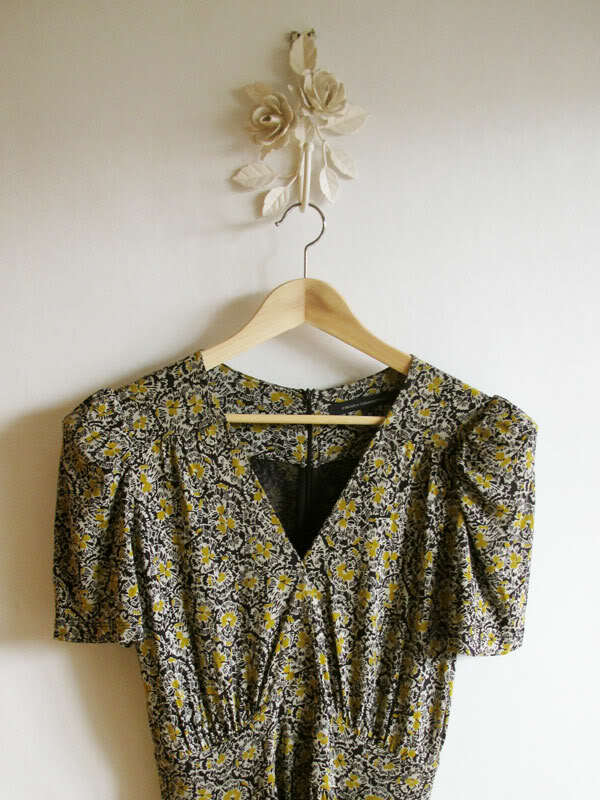 The jumpsuit is gorgeous, such a nice print and I love the shape around the top. 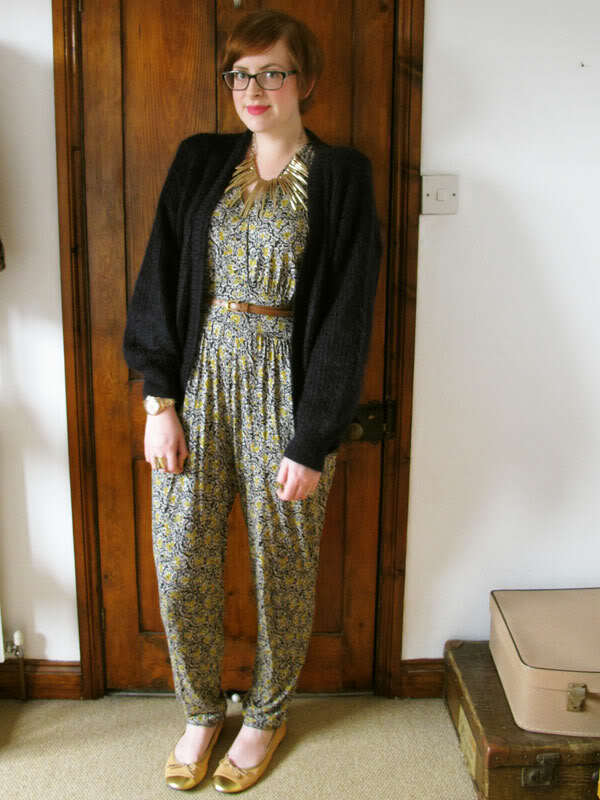 I must admit I have never worn a full length jumpsuit, I love a playsuit with tights for Autumn but will definitely keep an eye out for one now, looks good with the cardi. I’ve loved your alternative Autumn essentials posts this week and I’ve got a serious infatuation with the sequined pencil skirt. I think I might die if I can’t have it! it’s lovely! love the colours of it, & it really looks gorgeous on you. 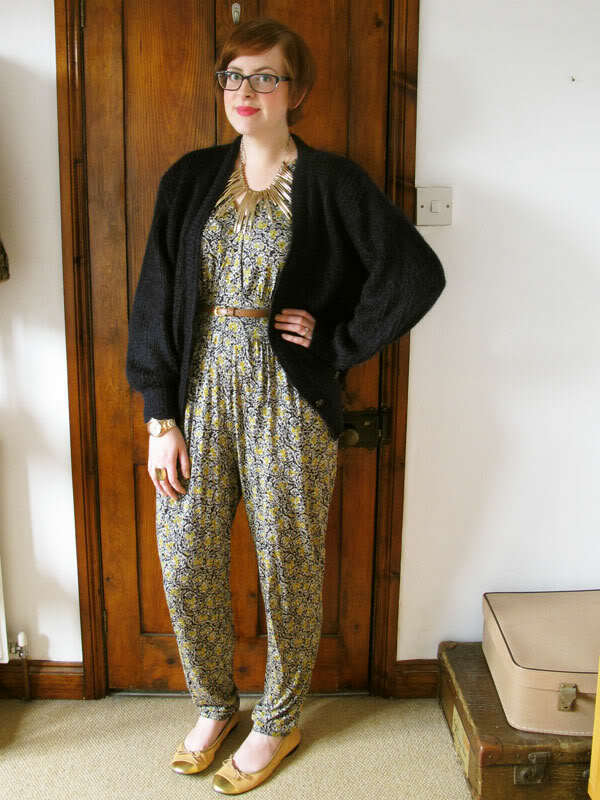 I think patterned jumpsuits are for the brave and quite frankly, I’m not brave enough. Good on you though for working this trend.